There are two Dutch-es in my life. 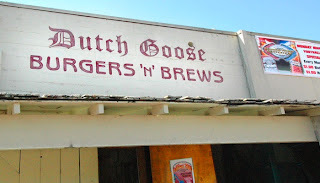 First, the Dutch Goose. It's a burger shack in Menlo Park and a place where I indulged on Fridays while working at Lighthouse. My man, Edgie Scott, took me there on my legendary 3.5 hour interview at Lighthouse in 02'. After lunching at the Goose with Edgie, I knew Lighthouse was the place for me and that Edgie, in addition to sharing my dining tastes, would be a great boss. The second Dutch in my life is Dutch Evans, a new blog written by my man Greg Yeadon. He's one of the funniest guys from Kellogg and I'll never forget his "gunner" routine, firing an imaginary gun turret from the back row when people were "contributing" a little too much in class. 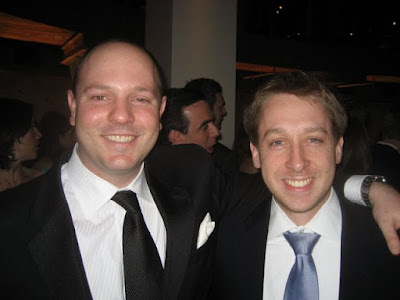 Here's a shot of Greg and me, just so you know how dapper he can be.